Pure Chinese Silk, so Lustrous it glows, tremendously lightweight and smooth. This fabulous yarn is spun in China in a 5/2 gauge. It is a 2ply yarn, hence the "2" in 5/2, with the five being a measure of the thickness of the ply. The end result is a yarn that is approximately the same thickness as a DK cotton yarn. 1250 ypp, about 138 yards per 50g skein. 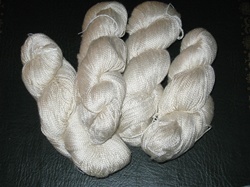 Silk yarn has many great qualities, but be aware that pure silk has almost no elasticity, and will stretch when wet. If you choose the right projects for pure silk yarns, you will be very pleased. Try this yarn on larger needles for a lacy shawl, scarf or even a lace over-blouse with little shaping. Nothing is more elegant for a bridal ensemble. The finest quality natural undyed silk. This can be used in any project to create a soft, luxurious fabric.